I took no photos of the liver out of respect for the squeamish. Bob was skeptical, but he declared that the liver was pretty tasty. Start with good liver. I got “Country Natural” liver at PCC. It was already conveniently sliced into pieces that were between ¼ and ½ inches thick. Soak the liver in milk for about 20 minutes. The soaking is supposed to make it more mellow. Cook 4 slices of bacon slowly in a cast iron skillet. You want to render the fat for the liver. Remove the cooked bacon from the pan. Do what you want with the bacon. (Bob ate all 4 pieces on the spot.) Increase the heat for the bacon fat to medium. Dredge the liver in flour that has been mixed with about a teaspoon of seasoned salt, like Tony Chachere’s Creole Seasoning or Paul Prudhomme’s Magic Seasoning Salt. Sprinkle the floured pieces of liver with a bit of plain sea salt. When the bacon fat is hot enough to make a bit of flour sizzle, add the liver to the pan, salted side down. Salt the top side of the liver. Cook for about 2 minutes. Turn, and cook for about 2 minutes more. Serve and be amazed at how yummy it is! Bob, in fact, liked the liver more than he liked the broccoli! He just does not like broccoli unless it’s raw. Chop up the broccoli into bite-sized pieces. Peel and slice the garlic. 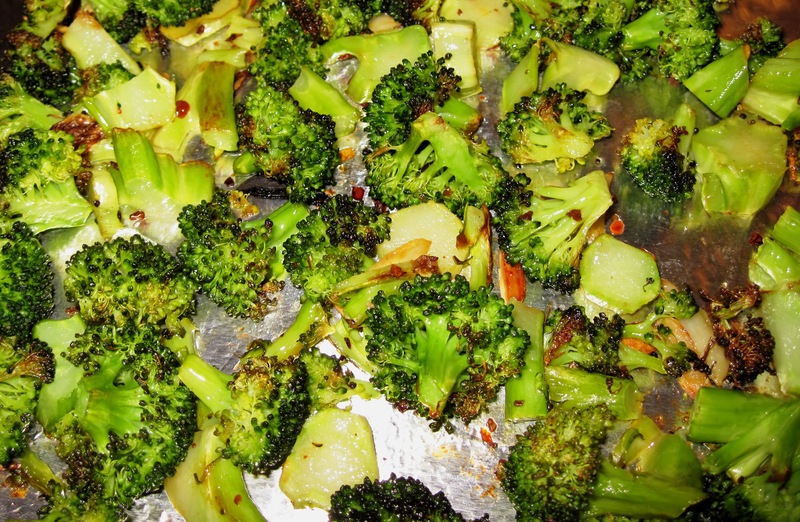 Toss the broccoli, garlic, red pepper flakes, and a bit of olive oil together. Put it all on a baking sheet and sprinkle with salt. Roast for about 25 minutes, stirring once or twice during the roasting time.